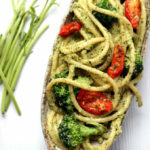 Love Vegetarian Pesto Pasta Dinners? I have so many more! Check out my pesto archives! 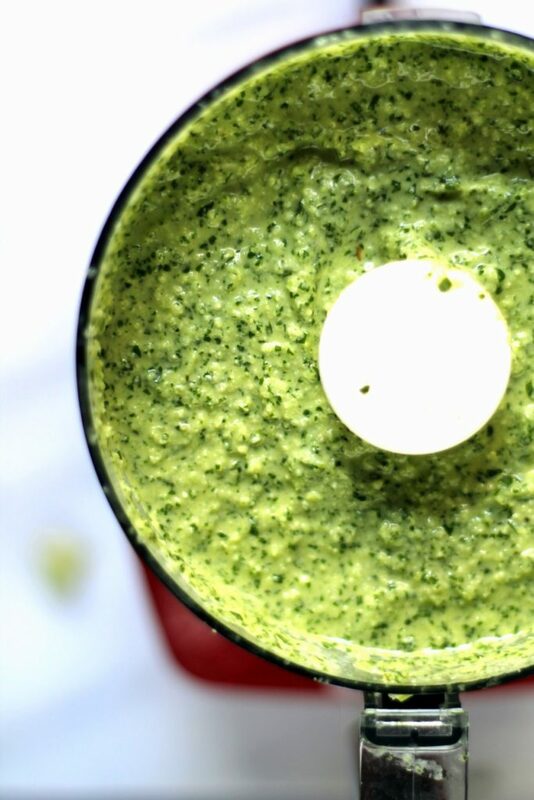 There’s roasted garlic pesto, kale pesto, red pepper brie pesto, and more! I’ve also compiled a roundup of 65 Veggie Pesto Recipes including all of mine + other blogger’s creative recipes. We’ll use an entire broccoli in this recipe by turning the stems into a fresh, lemony basil and broccoli pesto! A light, healthy, vegetarian + vegan pesto pasta dinner, ready in 25 minutes. Boil pasta according to package instructions, adding the broccoli florets to the pan 2-3 minutes before the pasta is ready. Drain pasta and broccoli and return to the pan. Add the pesto and stir through over a very low heat. Serve topped with sundried tomatoes. I made this with two fairly small heads of broccoli – if yours are large, just use one. That looks truly delicious! I have made kale pesto before but really want to try broccoli. Do you use raw stalks, or cook them first? I’m sorry it’s taken me so long to reply! I use raw stalks. Lightly steamed or cooked stalks would work fine too if that’s what you had to hand – it would just create a more creamy sauce! Fantastic! I followed your recipe but used 1/3 cup mixed nuts, basil & parsley and lime juice because that is what I had. Also added a chopped zucchini and heirloom tomato at the end because these were picked from our garden this morning. Love this recipe. Thank you. I made it healthier by substituting water for the oil. My favorite meal. Perfect recipe for vegan dinner guests! The sun-dried tomatoes are the perfect topping for this healthy and tasty recipe. Hi! I was wondering what I could use instead of pine nuts? Thank you! Cashews work well in place of pine nuts! Or if you like the flavor of walnut, that could be worth a try too.